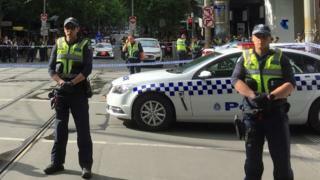 A man has been arrested after a “small number of people” suffered stab wounds in an incident in central Melbourne, Australia. Victoria Police said the arrested man had been taken into custody in a critical condition. They had initially been called to reports of a car fire. Paramedics said they had treated three people at the scene – one is suspected to be in a critical condition. “The exact circumstances are yet to be determined at this stage,” they said in a statement. They were initially called to reports of a car fire in Bourke St, a busy thoroughfare. Two police officers can be seen attempting to subdue a man who appears to be running at them with a knife. The police and State Premier Daniel Andrews asked people to avoid the area, which has been cordoned off.